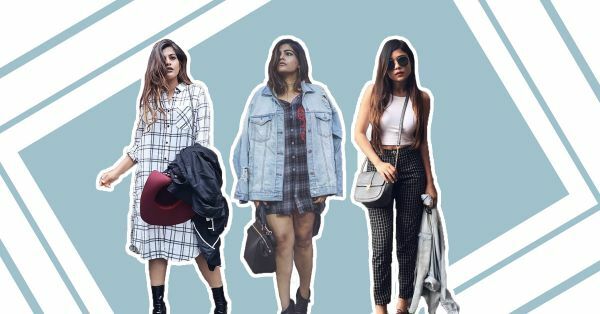 The Plaid Trend: 7 *Different* Ways To Wear It! Often when plaid is mentioned, it is always in conjecture with a certain occasion. It is typecasted as being a grunge fav or a lumber jack’s choice of clothing, you know, something associated with heavy lifting! But this season has seen a revolution in terms of styling the plaid trend. Take cue from Coach that put the sultry Selena Gomez in a plaid inspired short jumpsuit! The trend was also seen on the runway quite often. From designers like Jenny Packham at the New York Fashion Week to Marc Jacobs, we have designers breathing a new life into the trend! We would love to get on board with this often underrated style. The type of look you can go for with plaid is diverse from layers to statement pieces. We have curated some looks that can work as plaid inspiration for you to ease into the trend! Baggy plaid shirts can work wonders for a casual but trendy look. Pair them up with solid shorts or distressed boyfriend jeans and add a chunky boots to the mix! Little plaid dresses are super cute and when paired with a basic belt can be a chic outfit. The plaid pattern ranges from shirt dresses to shift and come in a variety of check sizes. Pair them up with casual sneakers and a smart messenger bag! Plaid trousers are a safe bet when you need to put a spin on your usual pair of formal pants. Pair them up with fitted crop tops and some nice brogues for the ultimate smart casual look! The button downs are a diverse bunch. With plaid, you can go for a tucked in look or use them as an overshirt for your “not so modest” crop tops! Plaid pant suits are a great slimming option! The pattern makes your frame look longer and they are a good bet when you wish to experiment with colour. Don’t forget to throw in a pair of strappy sandals to the mix! Flared skirts are not limited to just school girl costumes! Reminisce your school days with a cute plaid number. Opt for a fit and flare skirt and pair it up with a solid tee and platform shoes to complete the look. Scarves are a seriously underrated accessory due to their seasonality. On the other hand, the plaid variety of scarves are super lightweight and can be donned with your casual outfit. Accessorize your tank top and skinny jeans with a nice plaid scarf!